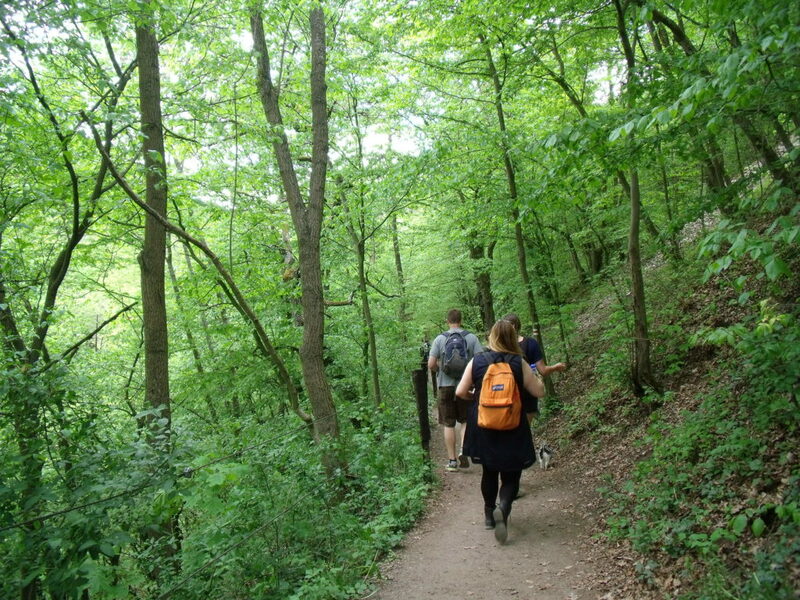 The Czechs love hiking and as the weekends get warmer, they will be heading out in large numbers to some of the Czech Republic’s most popular hiking spots. 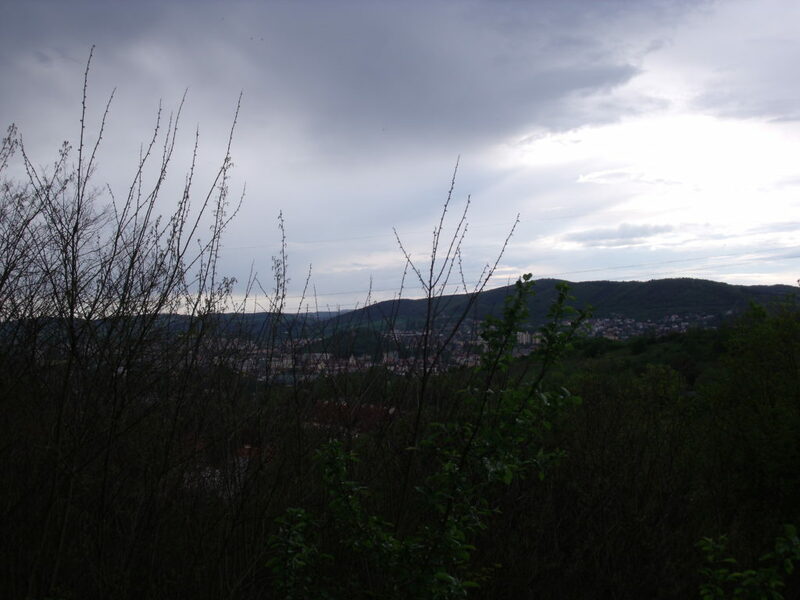 Since moving to Prague, the Czech passion for hiking has inspired me to take some really memorable trips. 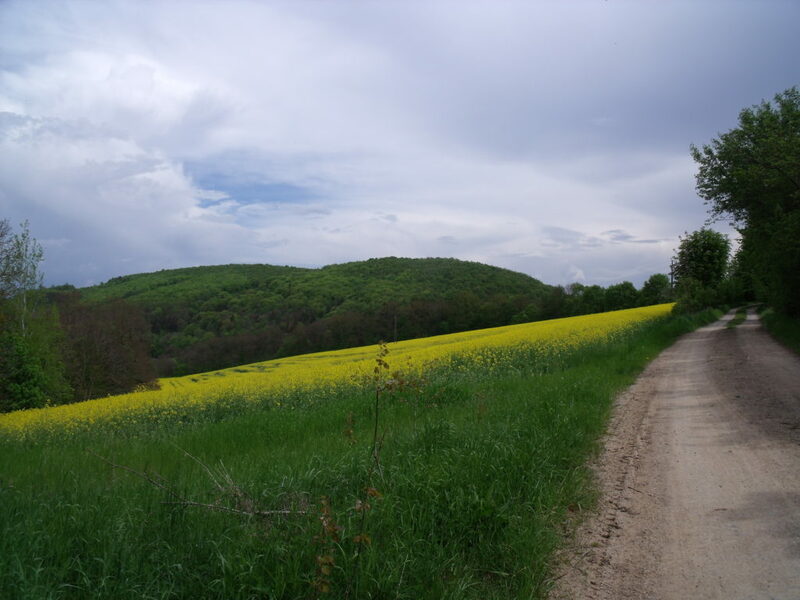 Yesterday, some friends and I took a stunning, exhilarating and in parts a pretty tiring trip from the town of Karlstejn to the town of Beroun. 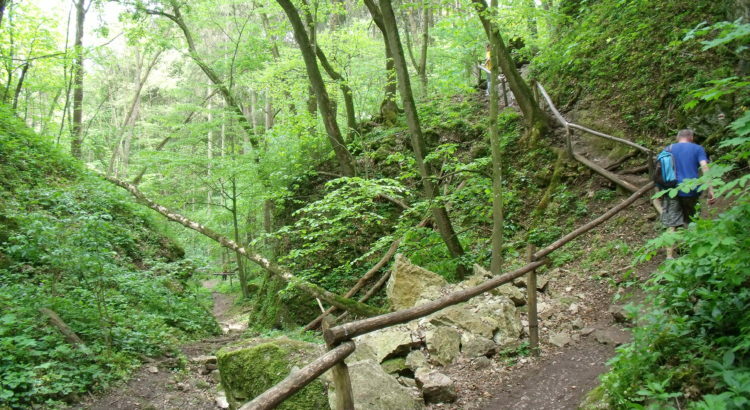 This trail is actually the oldest maintained hiking route in the Czech Republic and I thoroughly recommend it for an excursion which is challenging in addtion to being full of drama, beauty and no shortage of surprises. 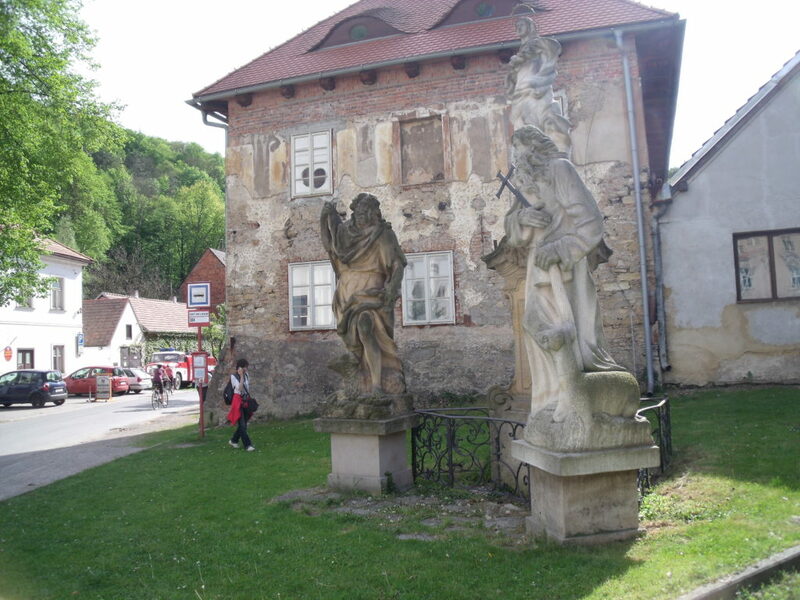 The starting point, Karlstejn, is really easy to get to from Prague. Trains to Karlstejn leave from Hlavni Nadrazi (Prague’s main train station) every 30 minutes and the train journey takes just 40 minutes. The brewery in Beroun is right next to the train station and from here you can hop on a train straight back to Prague. The trail you need to follow is really well marked from start to finish, so you don’t need to worry too much about navigation. The hike is just beautiful and there are some really interesting sights along the way. These include Karlstejn Castle and the beautiful village of Svaty Jan pod Skalkou. 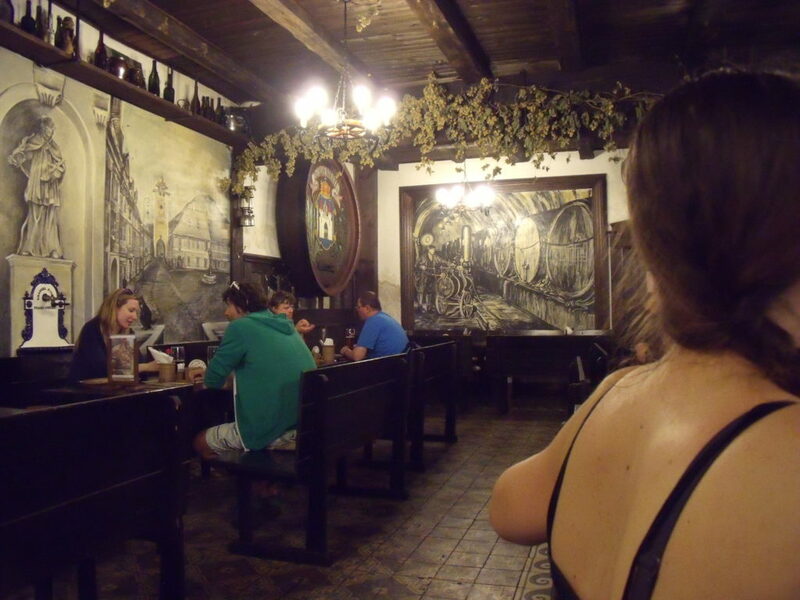 Your journey will finish up at the Beroun Brewery, which is simply charming and boasts a bustling and authentically Czech atmosphere. Here, you can reward your hard work with a plateful of hearty Czech-style food and some really special beer. Time taken: The journey took us 5 hours. However, we were taking it pretty slowly. 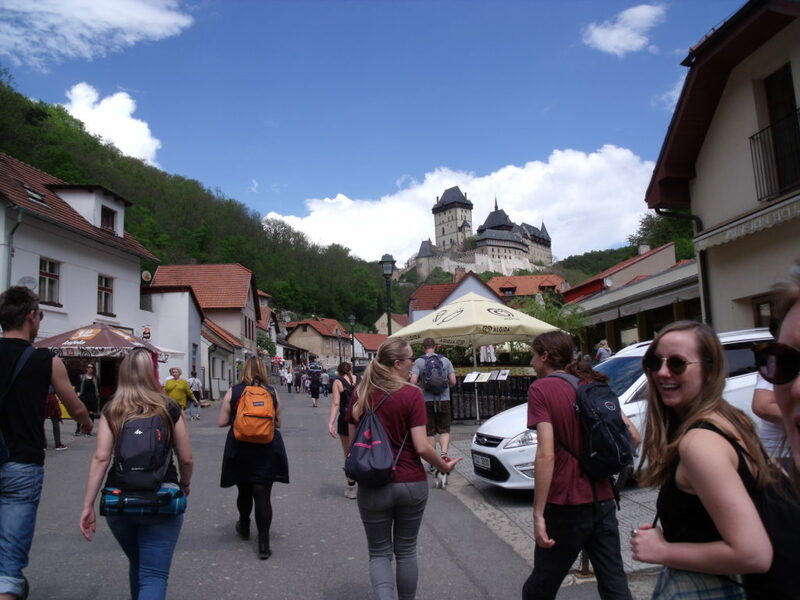 This time includes stopping for a beer in Svaty Jan Pod Skalkou, stopping for snacks, photos and a fair amount of time exploring Karlstejn Castle. Without stops, the hike should only take 3-4 hours. 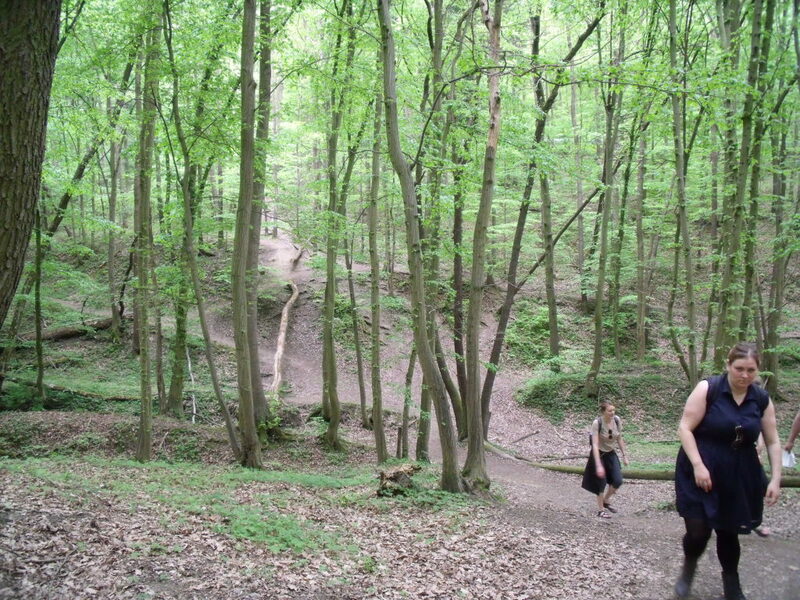 Terrain: The majority of the hike is through forest, so it’s lush, green and shady. There’s a fair amount of up and down, so be prepared to get the heart rate pumping and of course, wear comfy shoes! Your first job is going to be to make your way to the start of the trail. 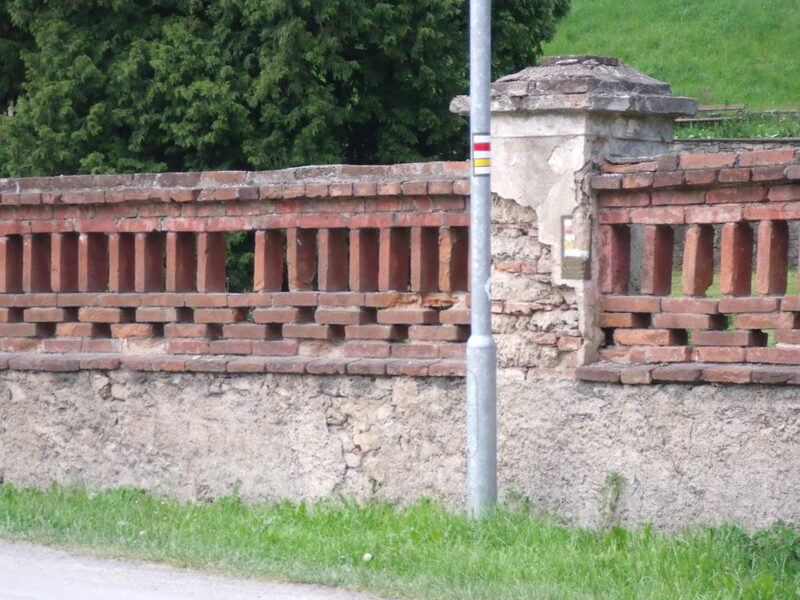 When you get off the train at Karlstejn, cross the river and then briefly follow the road uphill. 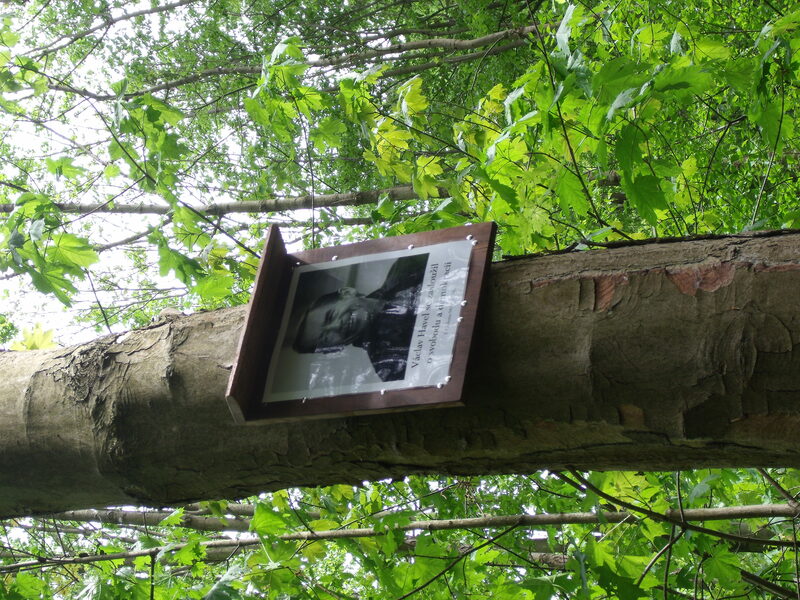 You will findyourself at the base of the main road which runs up through Karlstejn. There are some weird and wonderful things on this road, including an antique store specialising in Nazi paraphernalia, a perfectly ordinary looking house which doubles as a mini zoo and a museum which contains the Czech Republic’s largest mechanical nativity scene. It really is bizarre stuff. 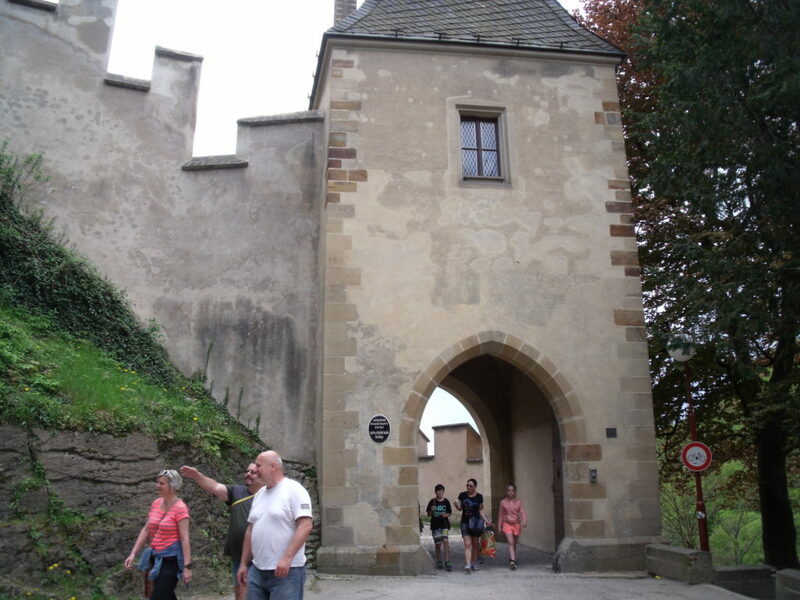 As you continue walking up this main street, you will catch your first glimpses of Karlstejn Castle. The trail you need to take actually starts at the castle, so keep heading towards it. It really shouldn’t be difficult to find as there will more than likely be lots of visitors heading in the same direction. This is the first significant climb of the day, as Karlstejn Castle is perched high up on the hillside. Karlstejn is full of friendly pubs, cafes and restaurants, so if you’re not sticking to a strict schedule, you could stop for a breather. 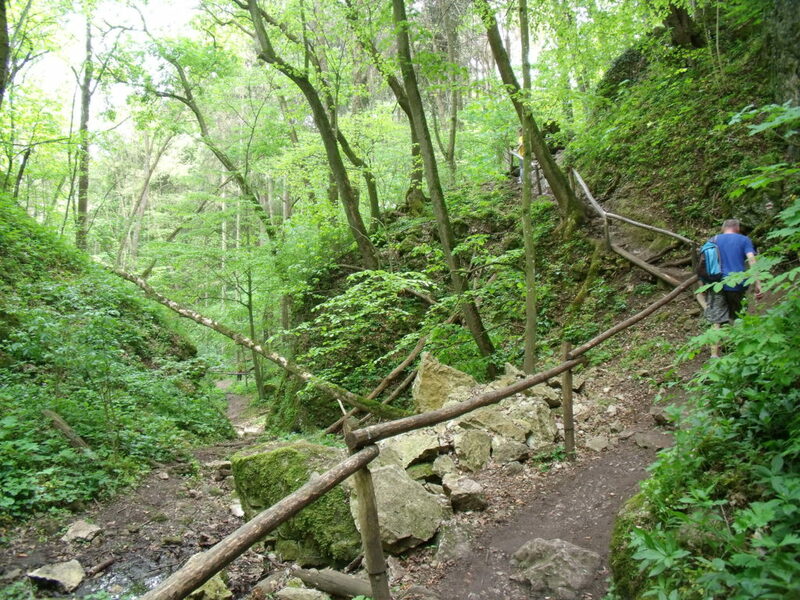 When you reach the castle walls, you will have also reached the start of the trail. However, it’s well worth taking a detour through the archway and getting up close and personal with the castle. Although you have to pay a hefty fee to go into the castle itself, there are fantastic views to be got from the castle courtyard. Once you’ve had your fill of the castle, it’s time to hike! 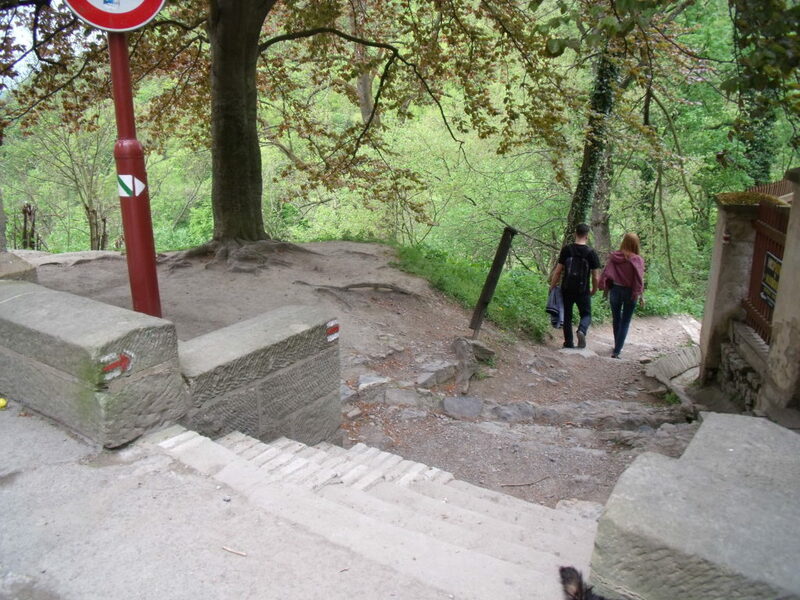 Take the narrow and rocky downhill footpath immediately to the right of the castle’s main entrance. 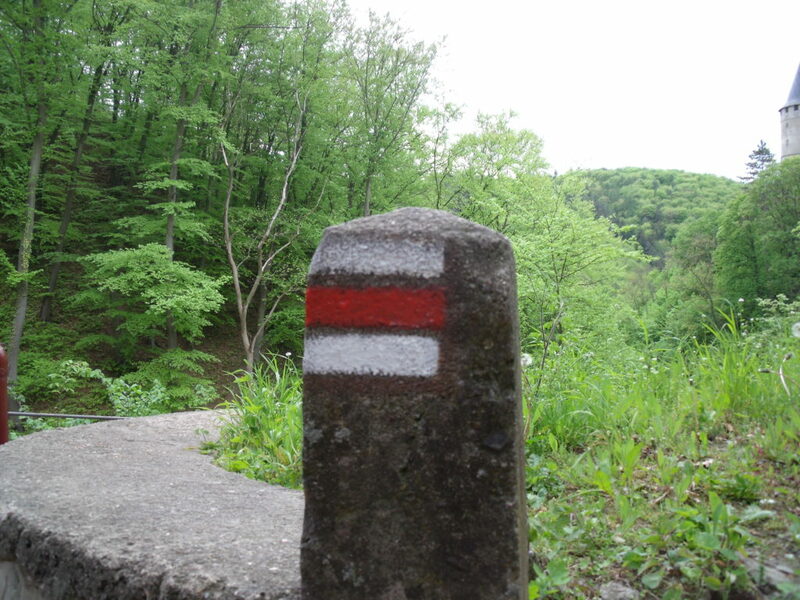 It is marked with the “red trail” marker. 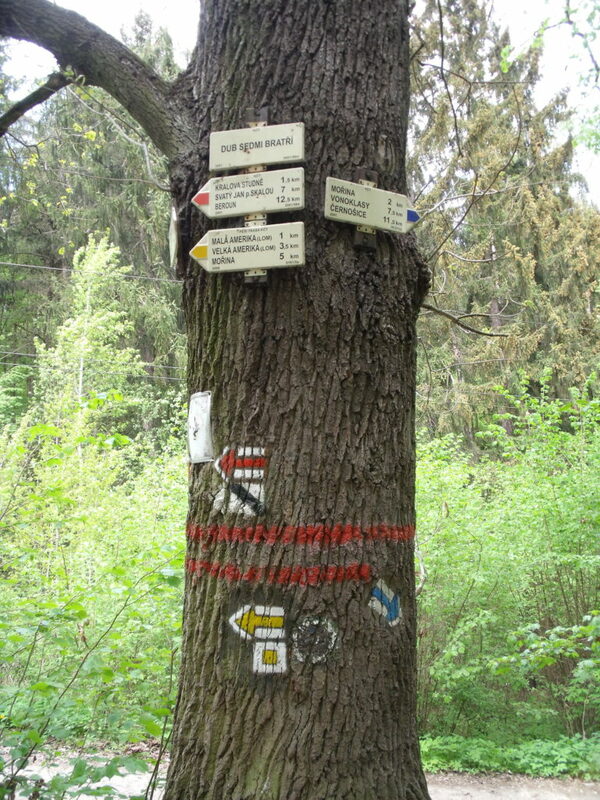 These helpful painted red symbols are what you’re going to be following for the rest of the hike. You’ll spot them painted on to trees, fences, walls and lampposts. They’re generally easy to spot and will ensure that you don’t wander off track. If you go about 30 minutes without seeing one, there’s a good chance you’re going the wrong way, so keep an eye out. 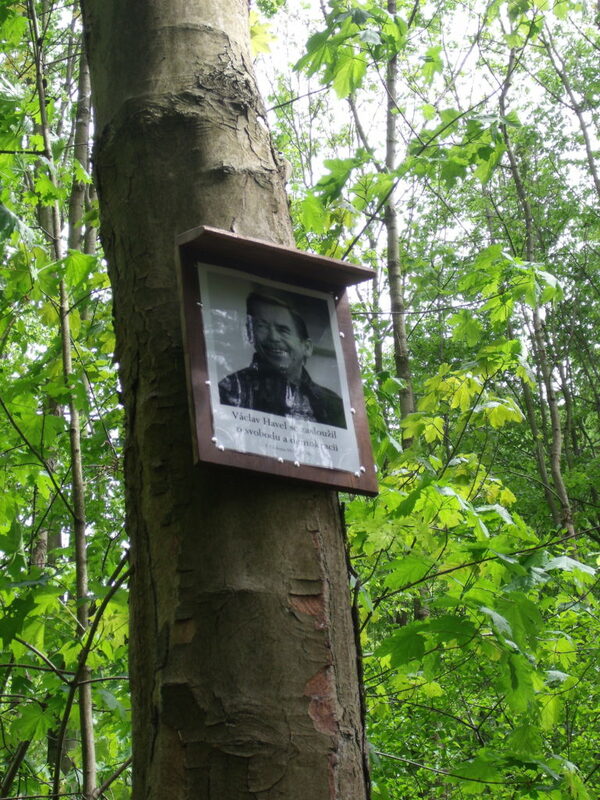 You will also come across these helpful signposts at regular intervals along the trail, which tell you how far you’ve come and how much further you have to go. The first few kilometres of the trail were relatively flat and took us through some gorgeous and vibrantly green stretchs of forest. The spring flowers were already well into bloom, the birds were singing away and the mood of the group was pretty upbeat. We also came across these brilliantly yellow rapeseed fields, which just looked perfect alongside the bright blue skies. From here, the hike got a little more rugged and the landscape became pretty dramatic as we made our way along the edge of this large waterless gorge in the hillside. At the top of the gorge, we stumbled across one of my favourite surprise finds of the day. The next section of walking was probably the most challenging of the day. 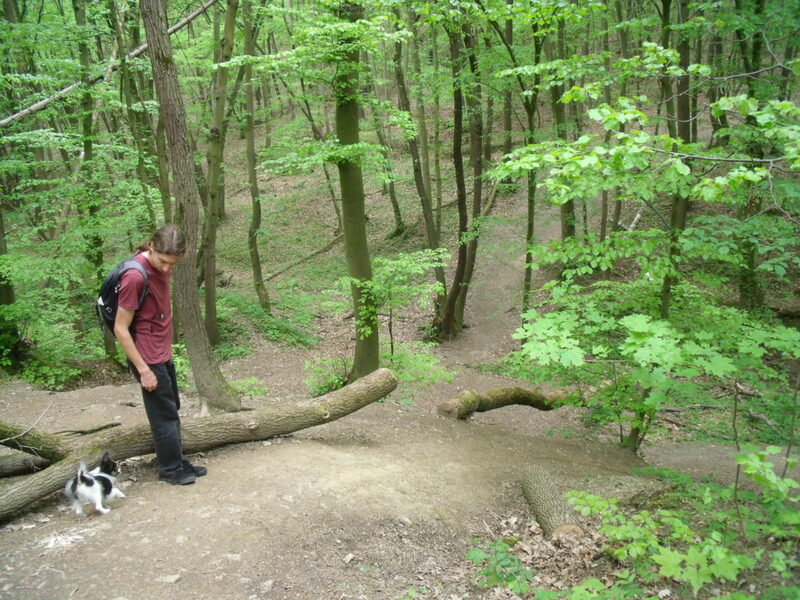 We were initially met with a fairly steep downhill section and of course, what comes down must come up. The uphill section which followed was long and punishing. Everytime I thought I’d made it to the crest of the hill, it seemed to impossibly get a little bit higher. The good news is that the hill did eventually end and once you make it to the top of the hill, there’s only one kilometre left between you and Svaty Jan Pod Skalkou, with the added bonus that it’s all downhill. 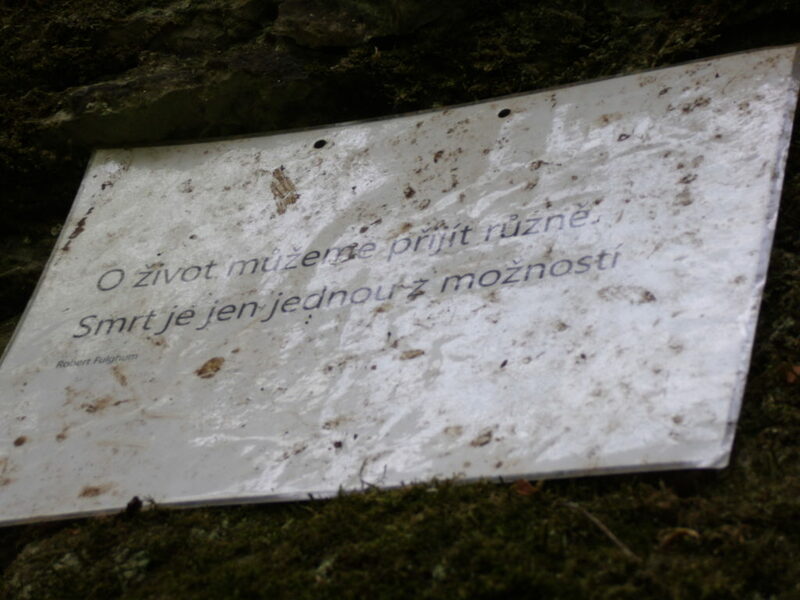 Svaty Jan Pod Skalkou (St. John under the Cliffs) has a population of just 120 people but over the years it has still attracted and inspired its fair share of distinguished writers, artists and poets. 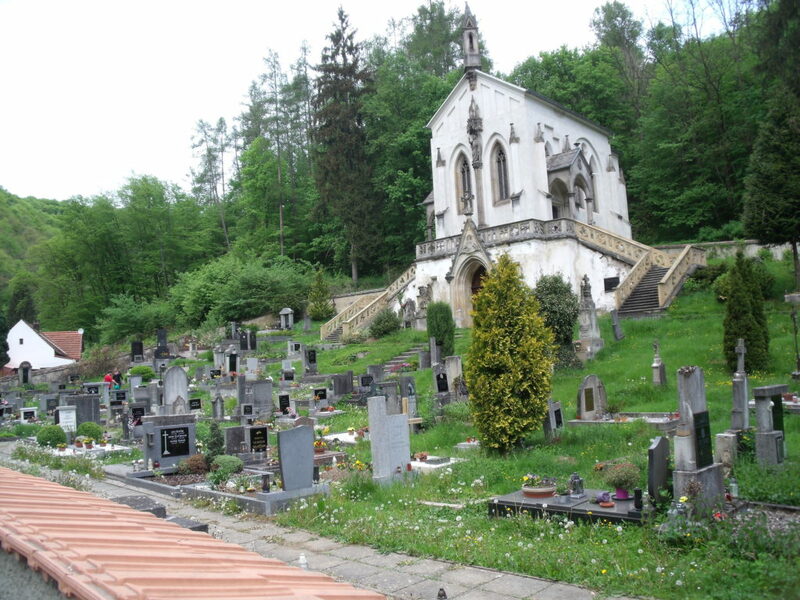 Today, its attractions include: St. John’s Benedictine Monastery, the Baroque church of St. John the Baptist and the famous cave (now a chapel), where according to legend the hermit Ivan prayed. 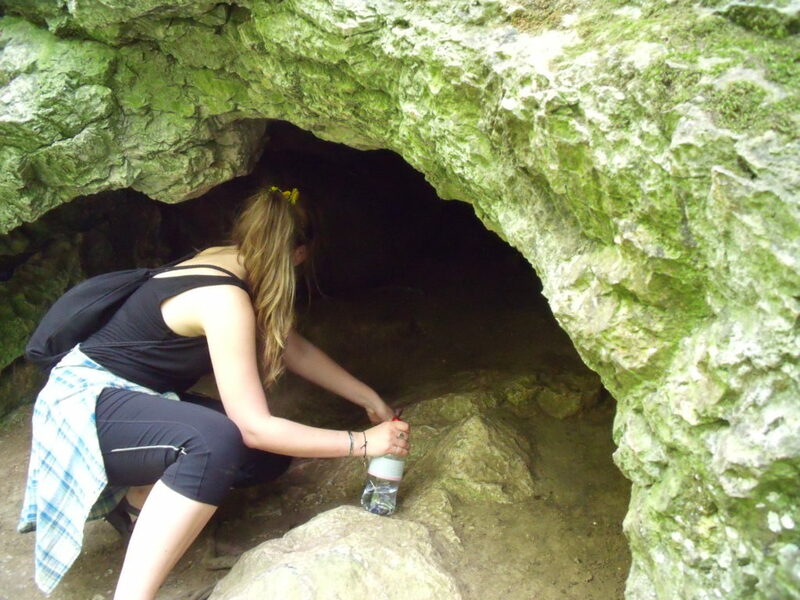 Just outside the cave there is a hot spring and the water here is said to have strong healing qualities. 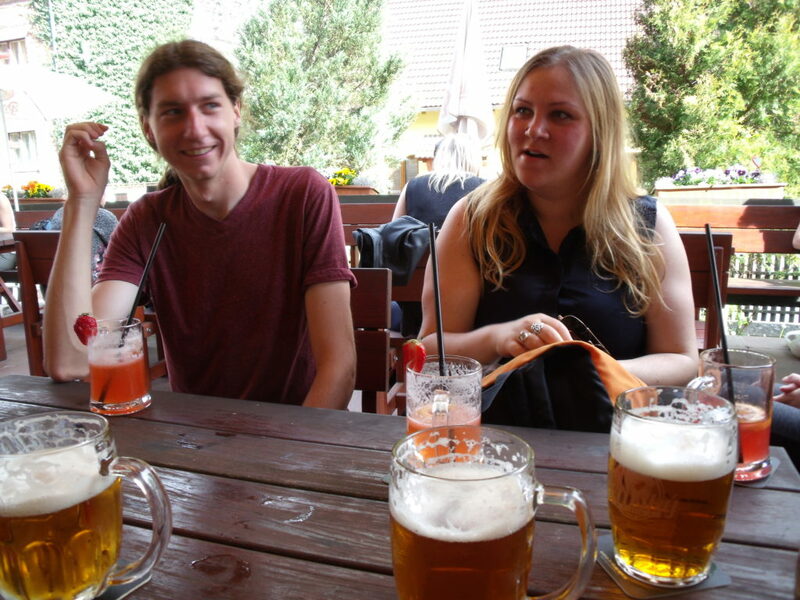 Upon arrival in the village, we headed straight the Obecna Skola pub and restaurant. This place has a good selection of beers and although we didn’t eat, the food looked great. Some of our group even ordered strawberry lemonades made with water taken from the local “healing” spring. A cold frosty beer on their sunny outdoor terrace was just heaven but sadly we couldn’t hang around for too long, as we still had a good 5 km of hiking ahead of us. The walk out of Svaty Jan pod Skalkou is perhaps the only point on this trail where there could be confusion about which way to go. The red marker is a little tricky to spot but you’ll find it here, taped to a lamppost. If you’re on the right road, you should pass the rather striking Chapel of Saint Maximilian and cemetery on your right. The bad news was that we were heading straight for the second big climb of the day but since we were freshly rested after our pit stop in Svaty Jan pod Skalkou, it didn’t feel quite so punishing and it was of course made all the more pleasurable by the stunning scenery all around us. At the top of the hill, it was exciting to see that we were getting pretty close to our final destination and from here on it was thankfully all relatively flat. Enthusiasm was almost tangible as we emerged from the forest and saw the town of Beroun sprawled out down in the valley below us. As much as I’d really enjoyed the hike, I was totally ready for a beer and a plate of food. Storm clouds were also gathering above us, so it seemed like the perfect time to take shelter. 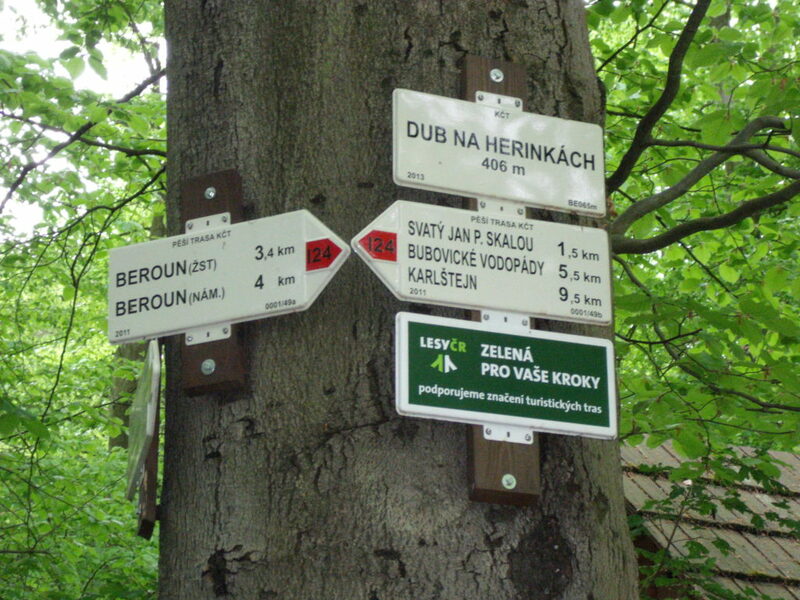 Once you’re in Beroun, you can continue to follow the red trail markers, they will take you to the main train station. 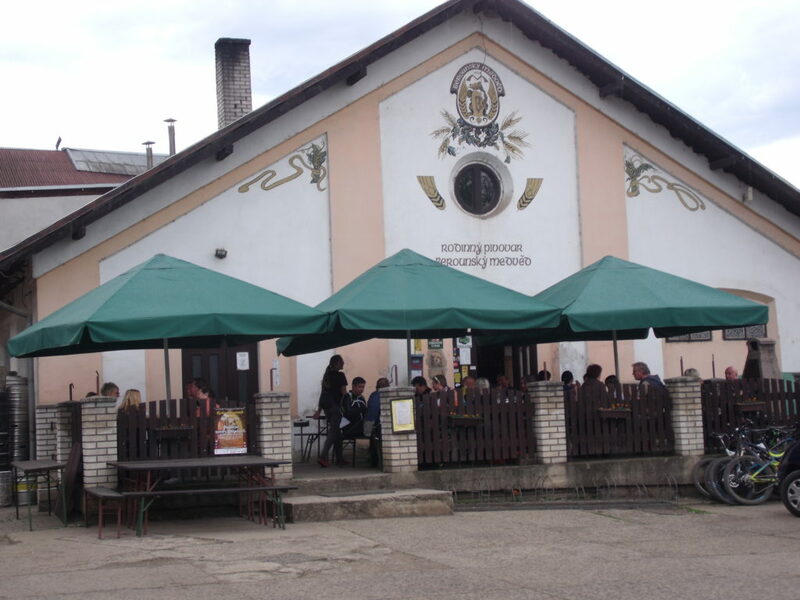 However, before jumping on a train back to Prague, I highly recommend a trip to Pivovar Berounsky Medved (The Bear of Beroun Brewery), which is right next to the train station. The brewery’s location took me a little by surprise, as it is to be found in an abandoned industrial estate. Although the area has a slightly dubious feel to it, the brewery itself is bright, cheerful and family friendly. 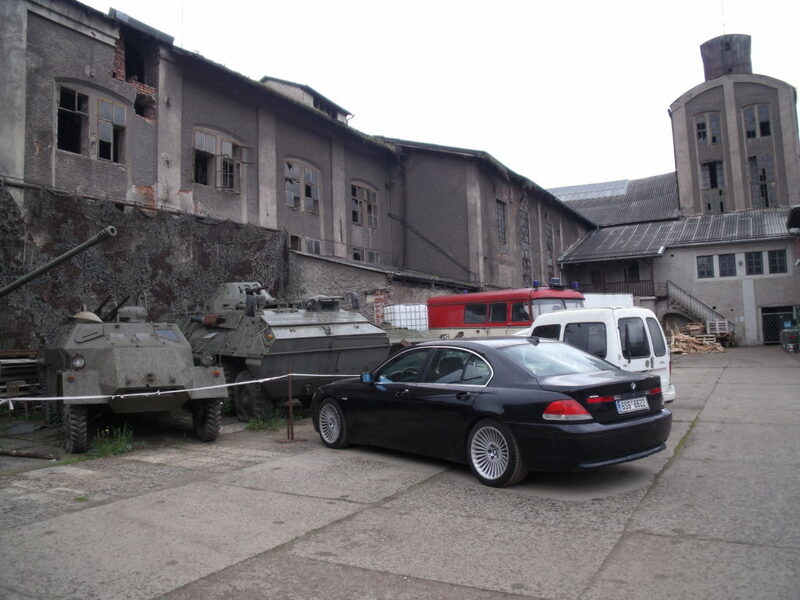 There is also a collection of old tanks outside, because why not? The beer that they serve here is some of the most unique and interesting beer I’ve tried in the Czech Republic. The food is really Czech, so expect lots of meat and impressive portion sizes. One of our group ordered pork knee, which I didn’t photograph but it was probably the biggest lump of meat I’ve ever seen on one plate. There is also a small kiosk where you can buy 1.5 litre bottles of beer to take away for only 40CZK, which is just phenomenally cheap for such great beer. Thank you for the excellent instructions. Fantastic hike on a beatiful day in early April. We are now sitting in the brewery enjoying a fantastic meal…and yes, the poke knee is huge! 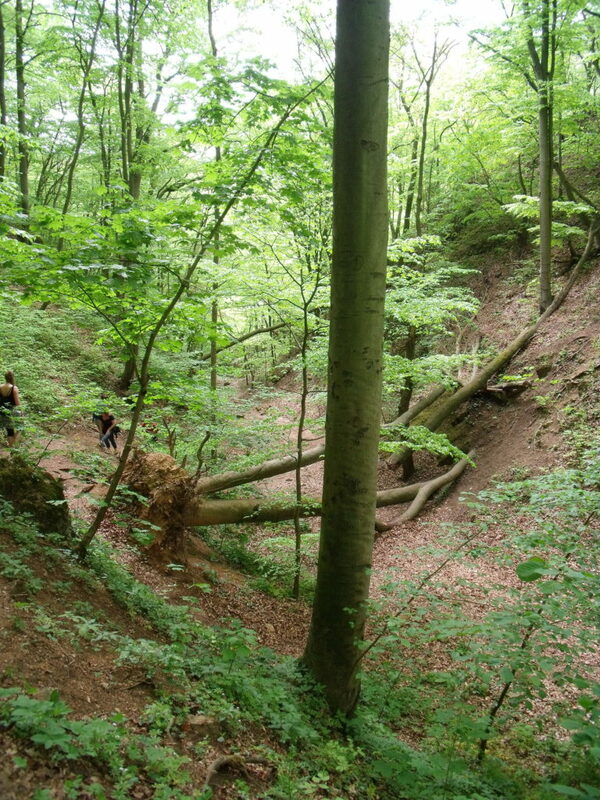 I did a very similar walk today, but I highly recommend extending your walk a little bit and going to see the Velky Amerika Quarry. There are absolutely spectacular views here, and it is not too far out of the way! Thank you for this article! We followed it completely and now enjoying the brewery lager!!! Thank you! Thank you for the detailed run through, very useful and I will definitely do this walk in the Spring. It was a beautiful and challenging hike! Thank you so much for this idea!